The Built Ford Tough Behind the Ride Sweepstakes is open only to legal residents of the fifty (50) United States and District of Columbia (U.S.) who are at least twenty-one (21) years of age or older. The Built Ford Tough Behind the Ride Sweepstakes ends at 11:59 PM ET October 22. 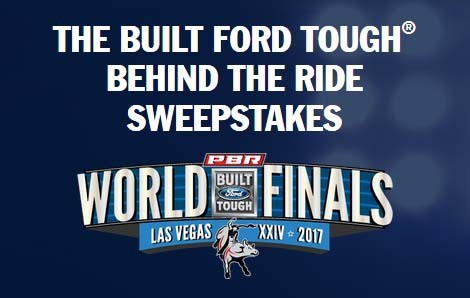 Visit pbr.com/ford and complete the online entry form with the required contact information and submit the completed Entry as directed. Limit one entry per person or email address. 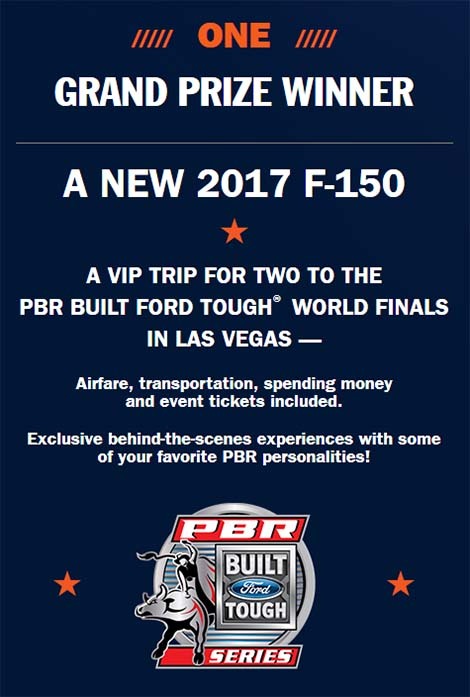 ONE (1) GRAND PRIZE – A trip for two (2) to attend the 2017 PBR BFT World Finals in Las Vegas, NV and a 2017 Ford F-150 (ARV $35,000). Total ARV of Grand Prize is $39,100. Trip Prize: consists of roundtrip coach air travel from a major airport near winner’s home to Las Vegas, NV; five (5) nights’ hotel accommodations; local ground transportation; two (2) tickets to the 2017 PBR BFT World Finals on 11/1, 11/2, 11/3, 11/4, and 11/5; various Sponsor-selected events and activities; and a $500 Gift Card. ARV of Prize is $4,100. Should I win, truck would be donated to HomeFront Equestrians and trip prize would be donated to a military family.